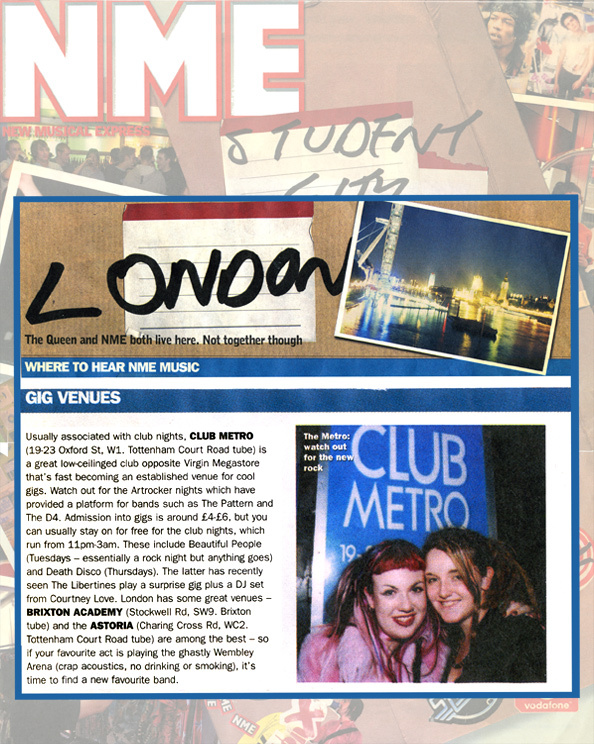 NME STUDENT GUIDE 2002: LONDON: WHERE TO HEAR NME MUSIC Usually associated with club nights Club Metro is a great low-ceilinged club opposite Virgin Megastore that's fast becoming an established venue for cool gigs. Watch out for Artrocker nights which a have provided a platform for bands such as The Pattern and The D4. Admission into gigs is around £4-£6, but you can usually stay on free for the club nights, which run from 11pm-3am. These include Beautiful People (essentially a rock night but anything goes) and Death Disco (Thursdays). The latter has recently seen The Libertines plasy a suprise gig plus a DJ set from Courtney Love.